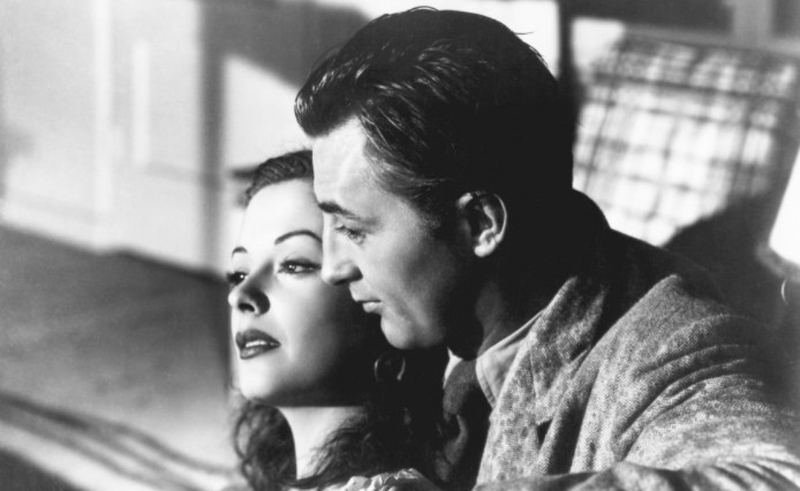 Out Of The Past is undeniably a film noir, and rightly regarded as one of the genre’s best. But apart from Roy Webb’s score, there’s little to suggest this in its opening moments. It’s nothing but sunshine and scenery as a car drives through the lower Sierras over the credits, ultimately arriving at the sleepy, scenic town where its driver stops for gas. Then the film reveals the driver: a trenchcoat-clad, cigarette-smoking tough named Joe (Paul Valentine), who looks like he’s stepped out of another sort of movie. For a while, it seems like he has. After asking Jimmy (Dickie Moore), the station’s deaf-mute attendant where to find the station’s owner, Joe sets up shop at a nearby diner, where he looks out of place, a big-city character with no business amid the small-town pleasantness. But when the film reveals the station owner, Jeff (Robert Mitchum), he looks like he was born to live in such a place. Enjoying a romantic picnic with his girlfriend Ann (Virginia Huston), he’s the picture of good living, clad in outdoor wear that might have come from Abercrombie & Fitch, and smiling as he enjoys another trouble-free day. Then he spots Jimmy, knows trouble has found him, pulls out a cigarette, and never stops smoking until the final scene. Jeff’s weary eyes suggest he knows what kind of movie he’s in, and where it will take him. That evening, taking Ann out for a drive and spilling his life story to her, he’s adopted the full noir uniform, fedora and all. Night has fallen, the shadows crept in. Director Jacques Tourneur understood shadows. Born in France, Tourneur got his first successes in Hollywood working for producer Val Lewton, making psychologically complex horror films like Cat People and I Walked With A Zombie that made a virtue of their low budgets by suggesting more than they showed. For Out Of The Past, Tourneur re-teamed with Cat People cinematographer Nicholas Musuraca to create a play of shadow and light in every sense. As Jeff explains on that long drive with Ann, he was once a detective hired by a deep-pocketed tough guy named Whit (Kirk Douglas, perfect menace-with-a-smile in just his second film role) to track down Kathie (Jane Greer), the woman who shot him and, he claims, left him $40,000 poorer. Jeff trails Kathie to Mexico, but once he finds her, he falls for her and stalls in bringing her back. When Kathie reveals she knows who sent him, she pleads innocent and asks if he believes her. “Baby,” Jeff replies, “I don’t care.” In the fatalistic world of film noir, that moment of surrender maps out Jeff’s future. Yet for all the labyrinthine plotting, chiaroscuro imagery, and snappy patter (courtesy of a script adapted by author Daniel Mainwaring, from his novel Build My Gallows High, with uncredited rewrites by Frank Fenton and James M. Cain), part of what makes Out Of The Past so effective is Tourneur’s decision to avoid overstatement and caricature. “And then I saw her, coming out of the sun,” Jeff says in voiceover, recalling his first encounter with Kathie. Greer looks stunning in the moment, but it’s played just as a beautiful woman walking into a bar, and it derives its drama from only that. This, in other words, isn’t the cartoon noir of Sin City, or even a later, more highly stylized noir like The Big Combo. Tourneur lets it play as a real moment between two people, and it feels all the more dangerous for it. Similarly, Greer is a consummate femme fatale, but not a caricature of one. She seems really to love Jeff, it’s just that her instinct to survive overwhelms all other emotions. That’s the other drama at work in Out Of The Past, the one going on beneath the double-crosses and briefcases full of incriminating information, one in which Jeff and even Kathie struggle to hold onto what makes them human when circumstances keep insisting they be cruel just to get along. Whatever happiness they manage to grab in daylight, it’s a noir world after all. Just one, but it’s a solid commentary track from noir expert James Ursini. Also worth noting: Warner Archive has done an exemplary job with this new Blu-ray edition, which could serve as a model for how classic Hollywood films should be treated on home video.